U.S. stocks rose after housing starts increased and earnings beat estimates. The Standard & Poor’s 500 Index added 0.6% to 1,312.62. The Dow average advanced 65.16 points (0.5%) to 12,266.75. A gain in March housing starts failed to make up for ground lost the prior month, as U.S. homebuilders continue to struggle almost two years into the economic recovery. Work began on 549,000 houses at an annual pace, up 7.2% from the prior month (starts fell 19% in February to the lowest level in almost two years). Despite releasing a mixed quarterly report by Goldman Sachs, the Dow steadily inching upwards to close 65 points higher at 12267 from Monday’s 140-point sell-off. The positive close was driven by stronger-than-expected Johnson & Johnson results and March housing starts. After the bell, Yahoo, Intel and IBM reported earnings that topped estimates. 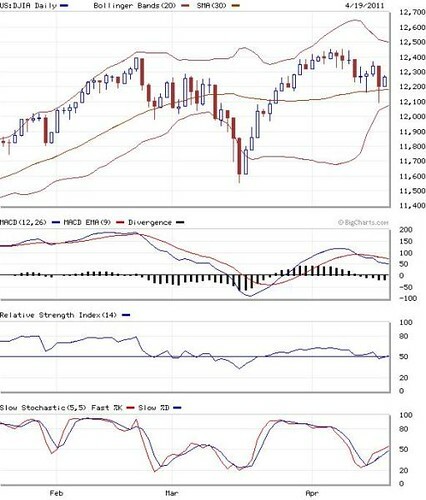 Daily Dow Jones: Consolidation To Continue Above The Lower Bollinger Band.